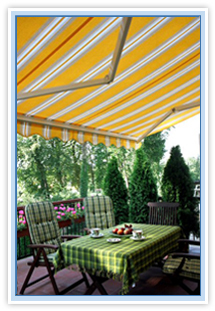 The Rolset company offers you a wide range of awnings. widely used as a protection against sun and rain on roof terraces, squares and balconies. Thanks to the diversity of models, the awnings can turn out to be essential in functional designing of garages, cafes, gardens or your favourite places of rest. In our rich offer we wish to present you the diversity of models in accordance with your needs and taste. Uncomplicated, neatly designed structure, created with care about aesthetic qualities evokes a feeling of softness and lightness. Perfect for small balconies and terraces, they provide a shelter against the sun, unexpected rain and harmful ultraviolet radiation. A day started with a breakfast on a terrace or ended with a glass of wine for two in a garden living room makes life nicer and more complete. 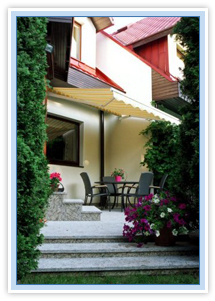 Case terrace awnings are the highest standard available on the market. They emphasise the uniqueness of your house and terrace. 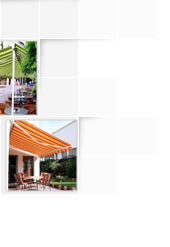 In our offer you will find awnings of the highest quality confirmed by the recognition of our clients. They were designed to be a decoration of every kind of terrace or balcony. They were made of the modern, available technologies. We invite you to relish the lazy, summer mornings under a perfect case terrace awning. The basket awnings have a remarkable decorative qualities and big constructional capabilities, adjusted to architectural demands. They are installed in shop and hotel windows as well as in restaurant windows. They are usually used as an advertising carrier. 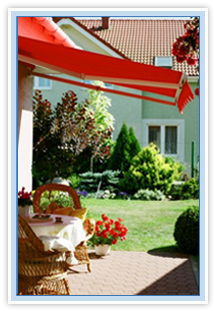 We offer you basket awnings in many variants allowing you to adjust them to any existing architecture. A solid, durable construction, perfect for sheltering tall windows. It constitutes a combination of merits of a roller-blind and a balcony awning. crank (at a minimum 30-degree inclination) or electric propulsion. It serves as a shelter for terraces and pavement cafes and restaurants. It provides opportunities for increasing the floor surface of an outlet. It provides a unique atmosphere of intimacy and uniqueness. Simple, reliable, economical solution proven throughout many years of use. The awning is operated with a crank, perfect for small windows and balconies. It provides an effective form of protection against the nagging solar radiation.